The first maggot paintings were created in the spring of 2001 in Hawaii. Since that time, Maggot Art has appeared three times as a featured exhibit in the Hawaii State Farm Fair and in many classrooms in both Hawaii and California. Additionally, Maggot Art was featured at Picnic Day, the largest student-run event in the United States and the annual open house for the University of California, Davis. 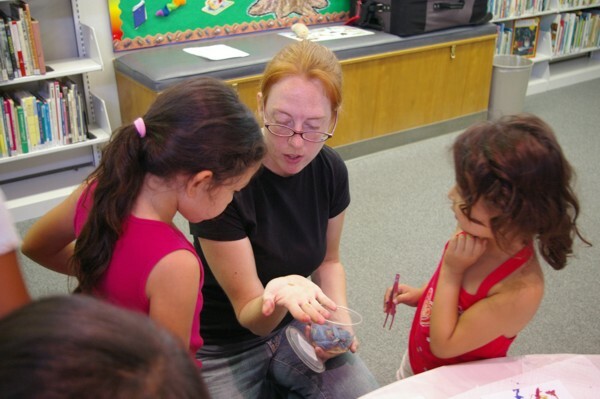 Rebecca O'Flaherty is the creator of the Maggot Art educational curriculum. She has an M.S. in Biological Sciences and is currently completing her Ph.D. in Entomology at the University of California, Davis. Rebecca regularly consults with law enforcement in Northern California and teaches workshops to investigators on how to recognize and collect insects from crime scenes. Many groups of insects have four stages of development in their lives: egg, larva, pupa, and adult. Butterflies are a well-known example of this phenomenon and have special names for two of the stages: a "caterpillar" is a butterfly larva, and a "chrysalis" or "cocoon" is the butterfly pupa. Flies also have four stages, and in many cases their larvae are called "maggots." What kinds of maggots are used for art? Maggots from the families Calliphoridae (the blow flies) and Sarcophagidae (the flesh flies) are used in the Maggot Art program. What do these flies eat? Blow fly and flesh fly maggots feed on rotting meat. They are extremely valuable as decomposers in the environment, but because of their "disgusting" lifestyle, their importance is often overlooked. Scientists even use flies to help solve crimes in an area of study known as "Forensic Entomology." Will the maggots or I be harmed in the making of Maggot Art? 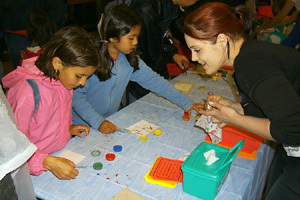 We use only non-toxic water-based paints to make Maggot Art. The maggots are not harmed by this paint, and they are released as adults after they have completed their development. In addition to cleaning the maggots before use, we handle them with forceps so you will not have to worry about contamination. Copyright © 2009 by Maggot Art. All rights reserved.